Why Do Africans Love Bobi Wine? 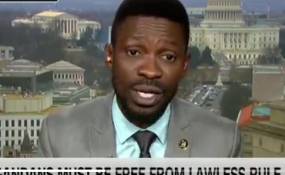 Bobi Wine being interviewed on CNN. Cape Town — Ugandan MP and musician Robert Kyagulanyi - also known as Bobi Wine - says he is considering running for president in the country's next elections. He was speaking to Robyn Curnow of CNN’s International desk. "Many people have come for me calling for me to stand; we have been discussing this issue with my team, and I must say, I and my team are seriously considering challenging President Museveni in the next presidential election," Bobi Wine said. He also said that there had been an intensive drive to persuade Ugandans to register as voters. The Independent in Uganda reports that he was declared African Personality of the year 2018 by the African Leadership Magazine. He beat Rwandan President Paul Kagame and Ethiopia Prime Minister Abih Ahmed who too were nominated in this category in awards that are held annually. The Independent writes that Kyagulanyi began his parliamentary career in 2017 with a fight in parliament not to amend the constitution to remove presidential term limits. He then resisted the introduction of taxes on mobile money and social media. Then, after a campaign rally, he and colleagues were arrested and tortured by security operatives for allegedly attacking the presidential motorcade. Because of his political activism, he has had several of his music concerts cancelled.